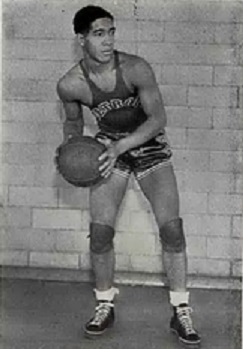 Larry Bleach was an outstanding all around athlete at New York Textile High School. In February of 1932, he led the school to the New York City high school basketball championship and just two months later, in April , he pitched the Textile squad to the NYC high school baseball championship. Bleach was a four-year starter at the University of Detroit, serving as captain in his senior season. After graduating in 1937, Bleach joined the Detroit Police department where he served for over twenty-five years. Bleach played independent basketball in Detroit into the mid-1940’s. He also made occasional appearances with the New York Rens and the Harlem Globetrotters when they toured in the Midwest. In 1939, Bleach was the Trotters’ leading scorer in the World Professional Basketball Tournament.